There's no question that the latest album from Mike Hadreas — best known as Perfume Genius — is good. No Shape is a rich, textual experience ("decadent" was one apt descriptor), and more ballad-heavy than the Seattle songwriter's earlier releases. Unfortunately, some of what made it so appealing is less apparent in the album's translation to a live show. That problem is compounded by the variations in Hadreas's sound across his back catalog — where No Shape deals more in ballads, previous album Too Bright demonstrates a more flamboyant sense of bombast, and earlier works read as almost Sufjan-esque. Put it all together in one live show, and it makes for some major tonal disconnects, and a show that feels a little all over the place. Compartmentalize Hadreas's Montreal show into individual songs, and there were some great moments, including from his most recent release. "Run Through Me" was an easy highlight from No Shape, a sumptuous slow jam with just the right queer twinge from Hadreas in its middle bridge. "Wreath" harnessed all Hadreas's onstage resources — most notable backup vocals to give an energetic vibe, with touches of Fleet Foxes. With near-tropical rhythms, "Slip Away" (the pre-encore finale) was a moment of heady energy onstage, delivered compellingly. But when energy gets pulled out for a few numbers like that, it becomes painfully apparent that it's absent elsewhere. Perhaps it was a case of lumping weaker tracks at the beginning, but multiple early tracks were short on energy: "Go Ahead" (also from the new album) was not overly tuneful, with Hadreas seemingly falling into speaking with a lilt in place of singing; "Longpig", the synthy followup, and "Valley" right after were both jaunty tracks that called for more oomph, and less demure floor-gazing. Almost in the middle of the set, one of Hadreas's new tracks, "Just Like Love," felt almost like a karaoke rendition, albeit a well-pitched one — uneven, and a little unsure of itself. There's little question that Hadreas is capable of delivering both the emotion required for a ballad or acoustic track, and the power to fill a room vocally — his closer, the crowd-pleasing "Queen" from 2014's Too Bright embodied both. 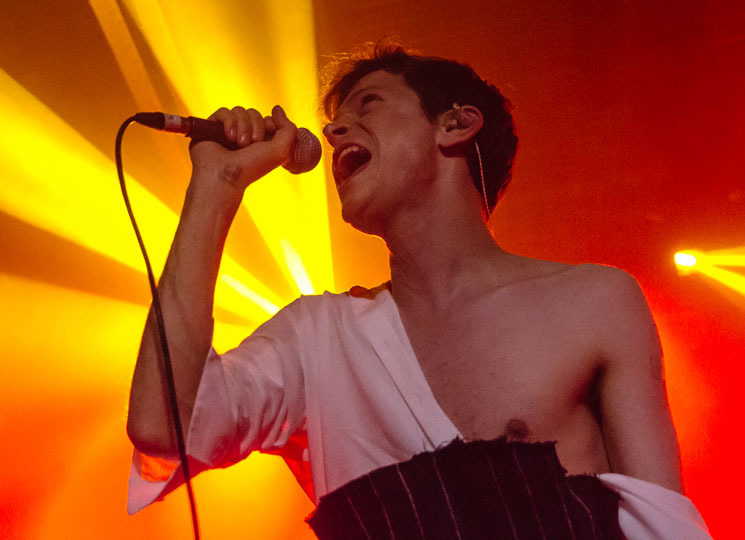 But when those qualities come and go minute by minute, compounded by a jumpy set list that perhaps tries to squeeze too much variety in, much of that shiny potential, writ so large on the latest Perfume Genius record, is whittled away in the live show.